A gathering of girls from the hosting city and neighbouring communities rally together to celebrate female diversity. The Annual Young Women of Power Conference is held at Foundations for the Future Chartered Academy (FFCA) High School. This conference takes place Friday Night & all day Saturday, May 10-11 2019 for girls between the ages of 12 to 18ish. The speakers are informative, yet entertaining, teaching girls how to live smart gaining tools that will help them to be more confident in who they are. 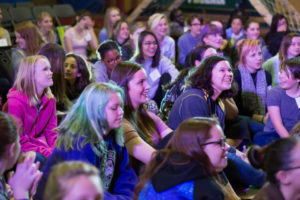 The workshops are interactive and designed to reveal each girl’s unique beauty, helping them celebrate who they are rather than wishing they looked like somebody else. The Conference consists of Keynote speakers, workshop presenter’s, a mini-concert and inspiring local girl talent. The conference surrounds girls with positive community role models along with exposure to supporting resources available in their community. Girls will hear top speakers and presenters address the four values of YWOP – Beauty: Inner and Outer Beauty Redefined – Wisdom: Street Smarts how to protect themselves from harmful situations – Power: They Can Make a Difference Globally & Locally – Principle: Holding on to their values. Topics Discussed & Activities are designed to build girls confidence in how they feel about themselves and encourage boldness to step out of the comfort zones to be bold. Main Objective – to break the cycle of abuse & violence against women by empowering young women with tools that will minimize their vulnerability in society.